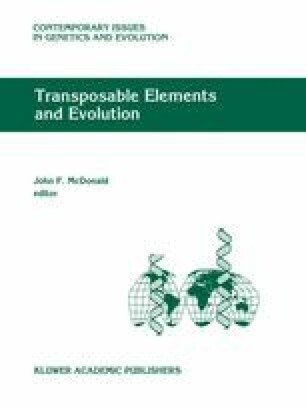 This paper is an attempt to bring together the various, dispersed data published in the literature on insertion polymorphism of transposable elements from various kinds of populations (natural populations, laboratory strains, isofemale and inbred lines). Although the results deal mainly with Drosophila, data on other organisms have been incorporated when necessary to illustrate the discussion. The data pertinent to the regions of insertion, the rates of transposition and excision, the copy number regulation, and the degree of heterozygosity were analysed in order to be confronted with the speculations made with various theoretical models of population biology of transposable elements. The parameters of these models are very sensitive to the values of the transposable element characteristics estimated on populations, and according to the difficulties of these estimations (population not at equilibrium, particular mutations used to estimate the transposition and excision rates, trouble with the in situ technique used to localize the insertions, undesired mobilization of TEs in crosses, spontaneous genome resetting, environmental effects, etc.) it cannot be decided accurately which model better accounts for the population dynamics of these TEs. Tendencies, however, emerge in Drosophila: the copia element shows evidence for deficiency of insertions on the X chromosomes, a result consistent with selection against mutational effects of copia insertions; the P element repartition does not significantly deviate from the neutral assumption, in spite of a systematic copy number of insertions higher on the X than on the autosomes. Data on other elements support either the neutral model of TE containment, neither of the two models, or both. Prudence in conclusion should then be de rigueur when dealing with such kind of data. Finally the potential roles of TEs in population adaptation and evolution are discussed.